Tech-savvy small businesses contract out IT work because it keeps them liquid and agile during growth periods. As a result, independent tech contractors can expect to stay busy, but may need to move to find work. Such are two important takeaways from a new LinkedIn survey report assessing the gig economy, which, according the Freelancers Union, counts for 35 percent of the workforce. Software and IT services has the largest number of freelancers of any industry segment. A decade ago, IT pros might have turned to freelance out of necessity, perhaps due to a layoff or shifting to a consulting role in the last years before retirement. Today, millennials prefer the freedom and flexibility of working for themselves. “That is not the exception but more the norm for them,” says Can Erbil, an economics professor at Boston College. For IT pros and developers, project-based work fits neatly inside a short term contract agreement. Their skill set translates readily across industry verticals which makes them highly mobile. For example, if you’re developing tools for a brokerage firm and the real estate market tanks, you may parlay your skills into a more stable industry like healthcare without extensive retraining. Techs will travel to where the work is—if the local economy is slumping, an IT pro will move to hot city and step into a better job market. That is the nature of the work. Small businesses hire 40 percent of all contract workers. Partly this is due to necessity—many can’t afford to hire full time—but you can’t deny there’s a forward-thinking attitude at play. SMBs are not overlooking a growing talent pool of voluntary independents and supplement their in-house staff as necessary. When a company decides to bring on personnel—a content creative or a developer in particular—they are looking for a disruptor, someone that can change the way people think with what they create. Enterprises pursue this young crop of disruptors as well, but might overlook their want for flexibility. From an HR perspective, a freelance developer and a traditional W2 employee both have risks—a flaky contractor that leaves in the middle of a project, or a bad hire that you have to fire—each has costs associated with them. SMBs, it would seem, understand the rewards that freelance market potentially will bring to the company and are willing double down on contractors. “Enterprises that need that dose of disruption are still focused on crafting the ultimate W2 bene package for the old disruptor character who will probably never show up,” Bethany Johnson, a freelance marketing creative, writes in a fantastic article in Content Standard magazine. It’s so easy to find contractors looking for work now. Creating an account on a message board site like Upwork and posting a job takes ten minutes. A company might spend 40 percent less (Upwork numbers) on the hiring process, and the site has built in ratings features which drives motivated freelancers to deliver their best work. It’s not perfect; Upwork suffers from the same flaws any services forum does. But that isn’t why corporate HR departments don’t use it—they abstain because they don’t know how to reconcile the gig economy with their traditional methods of onboarding. Meanwhile, the gig economy keeps moving forward with SMBs riding the wave. Collaboration software like Trello, Confluence, Slack, Skype for Business, and the like may be cloud hosted, or hosted on premises. Small companies without existing infrastructure love the start-now for cloud-hosting; companies with a datacenter might like the control and security that their own servers offer. It is always advisable to take a hybrid approach wherein a company will backup production data and other assets onto local file storage. That way you alleviate the risk of data loss if a cloud provider closes shop or incurs data loss. 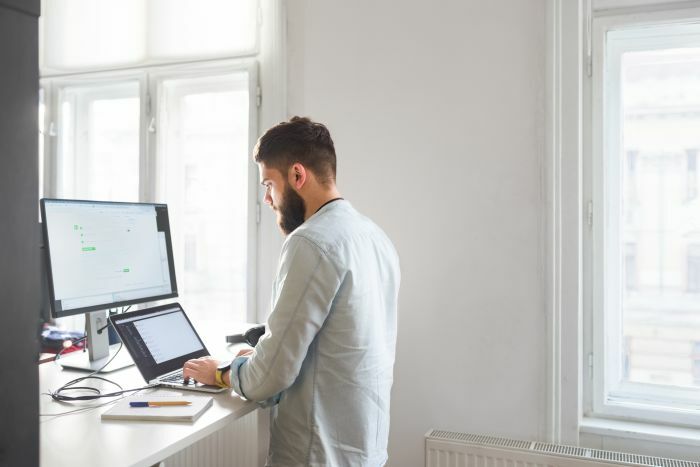 For SMBs considering supplementing your workforce with remote contract workers, make sure the office is set up for video collaboration and networked to support it. Enable a remote access VPN if remote workers are accessing the company datacenter. SSL-based remote access technology appropriately suits work-from-anywhere contractors using their own devices. If you prefer to video conference with remote workers consider a pro-grade desktop web cam priced around $100. Cheaper models will work fine for the most part, but it’s not expensive to get next level optics and auto-focus. You can’t go wrong with a Logitech C900 series web cam mounted on your desktop monitor. For the conference room, you will want a tabletop camera that records at eye level, and an omni-directional microphone built-in. See the Aver Information 520 series or Logitech BCC series to see two popular lines of conference web cams. Have tech skills, will travel: This is the attitude characterizing young technology creatives, and SMBs are riding along offering gigs and finding rewards. A tech writer and Raspberry Pi enthusiast from Orange County, California. How is this different from Newegg.com?